The data viewer show a semester of a yearly data set of the Wolf series, exactly as it is written on a single page of the Sourcebook as may be checked for the year 1849 with the figure above. The first and last columns of the main table contain the day labels. In the header of the table, the month is labelled with a roman number. For each day the observer is given in the first of the monthly columns. 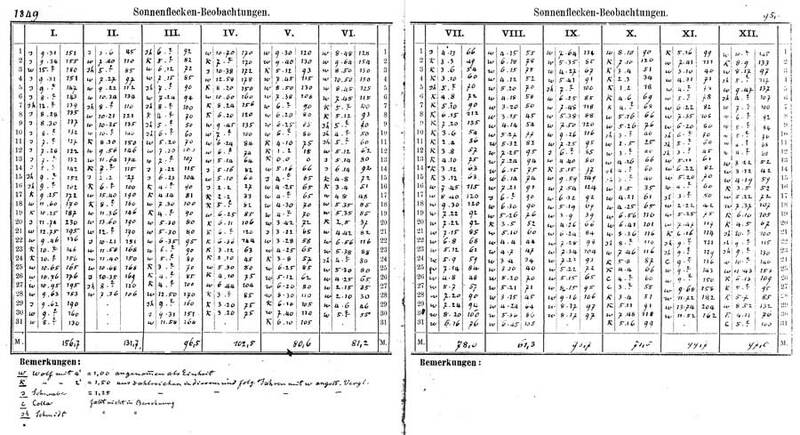 Below the table, in a section labelled "Bemerkungen" ("Remarks"), the observer codes are mentionned together with their clear names, k-factors and the details of the calculation of the factor, if any. In the next column of the monthly columns the number of groups and individual spots is given, separated by a dot. The last column of the monthly data contains the Wolf Number. In red a flag states, if the Wolf number was calculated according the formula Re = k(10 g + f) or was interpolated. If the observation is incomplete, either the group number or the spot number is missing. Most of these observations are numerically interpolated. For most of the incomplete observations the spot number is missing. If you want to switch to the other semester of the year, then you may toggle the according button. Another button allows you to mark or unmark all observations of the standardobserver with green color. Thus, the fraction of the calibrated "foreign" observations is seen. Normally, over 80% of the observations are due to the standard observer. The table gives also the monthly means, where the first number corresponds to the data given in the manuscript, the second one (in red color) is calculated out of the daily values given in the manuscript, while the third one is according to Waldmeier (1961). In the upper right corner the yearly means are given, with the same explanations as for the monthly means. The navigation from year to year should be self-explanatory. The viewer starts up with the year 1849, because this is the first year of the systematic sunspot observations of Rudolf Wolf. During the year 1877 the construction of the Wolf series was changed. Futhermore the Wolf series contained for a specific day not only observations of one observer at the same time. Additional insight may be gained with the dynamic graph which shows all the pecularities of the data set.